Despite its name, the resort is actually located in Zaragoza Island, which is under the municipality of Badian, three hours from Cebu City. The main area of the resort occupies about 8 hectares, plus another 5 in the Coral Garden beach in the same island, 5 minutes away by speedboat. 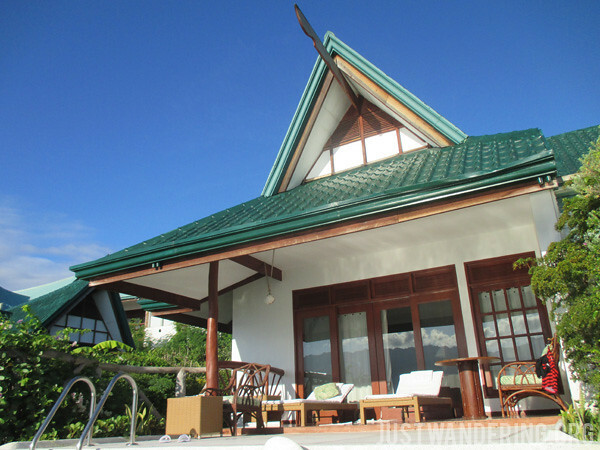 There’s a limited number of villas and suites in the whole property — maximum occupancy is just a little over 130 guests — so during the lean season, it is entirely possible that you will not run across any other guests in the property. It’s like having your own personal island. As we marvelled upon the awesomeness that is our Pool Villa, my friend Cla and I had the same thought: it’s like the Pinoy version of Cintai Corito’s Garden. 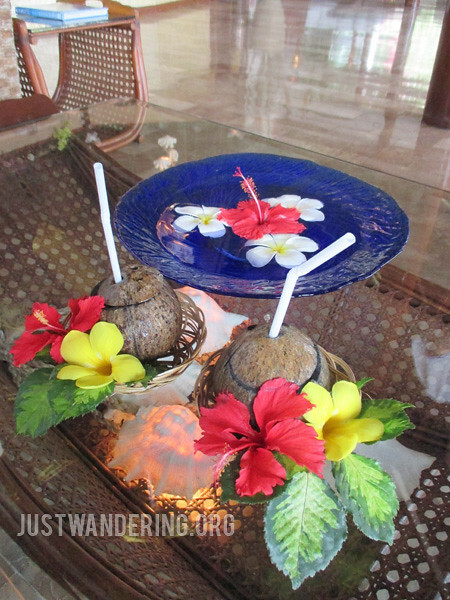 Where Cintai really brought Bali into their property, Badian Island Resort is very Filipino, which is fantastic. There was the judicious use of rattan, nipa, capiz, and sea shells, and though they look dated, it was just so Pinoy it’s amazing. 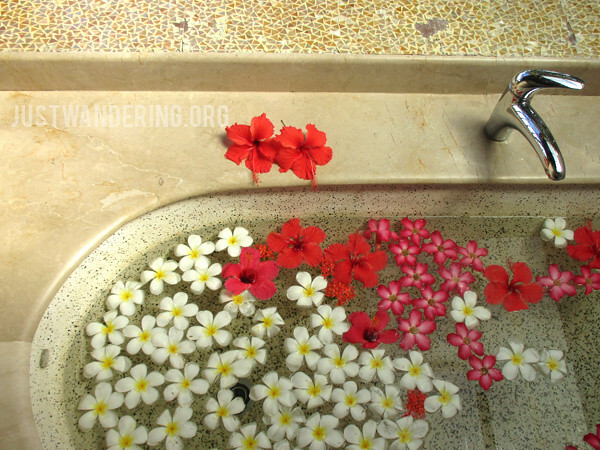 And there were flowers everywhere in our villa. Literally. The sleeping area. The toilet, bath, and vanity is right behind that big divider. I love the vaulted ceiling! 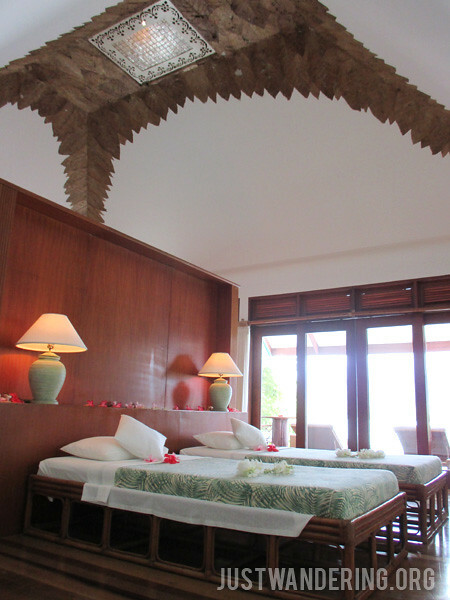 The Pool Villa is huge — almost 100 square meters big, and there more than enough room for us two. It had a twin bed, with individual lamps (with shades and bases that screams 80’s), a desk, a couch (which can be made into a bed), more than enough closet space, a dresser, and a minibar. The toilet and the bathing area are separate, and even better, the shower is outside the bathtub, which is kind of a big deal for me. You’ll have to be really comfortable with the person you’ll be sharing this villa with though, because of the absence of doors. Well, the toilet has a door, except it’s sort of see through. Cla and I, oddly not stranger to this kind of thing, already have a system for such occasion: when one is in the loo or the shower, the other stays on the other side of the room, or outside. Outside there are two loungers, a table, arm chair and a sofa, and of course, a small dipping pool filled with ionized sea water. Just in case you wanted the benefits of sea water without the sand and having to trek down to the shore. The water temperature is perfect, especially on sunny days. 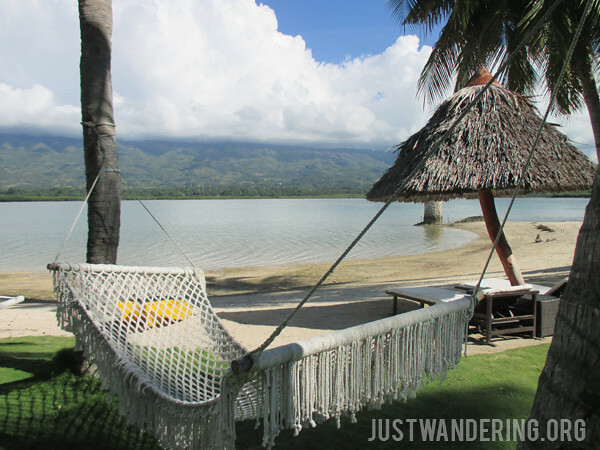 The island is located right between the main island of Cebu and Negros, so the water around the island is quite calm. 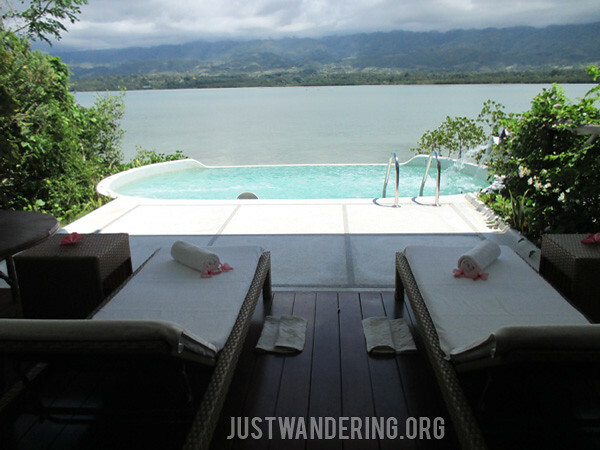 The pool villa faces the main town of Badian, so when you’re relaxing in the water, you get this stunning view of the towering Mantalungon mountain range, and the seemingly lake-like water between the islands. There are no televisions in all of the villas and suites, and that is by design. This is a place to enjoy the solitude and each other’s company. Wi-fi is available throughout the entire resort though, and 3G signal is present and strong, in case you can’t wait to share your #blessed afternoon. Still, even without these, there are plenty of things to do around the resort. You can get a massage, do yoga or Zumba, paddle board, kayak, swim in the pool, and play billiards, foosball, or darts. Snorkelling and diving are the top draws, though. There is a gorgeous Coral Garden just 5 minutes away from the main resort, which you should never pass up on. I feel like I’m not doing the Coral Garden justice. This is just a very small portion of what you can see there. 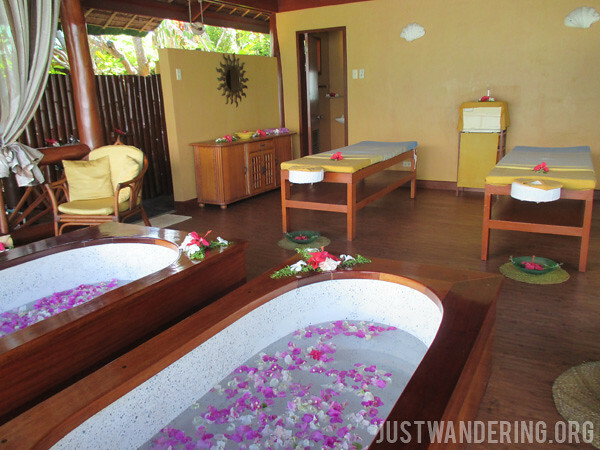 Being in Badian Island Resort can be likened to being in a bubble — you’re in your own little world, away from all the pollution and hassles of the city. Of course, this also meant that you’re at the mercy of their sole restaurant when it comes to food. Luckily, their chef know how to make really good food. Their menu is a mix of Filipino and Western dishes, and with 30 years of cooking at Badian, she knows how to please their guest’s palate. The main restaurant, Panorama, sits near the swimming pool. To make each evening interesting, the venue varies every night — it can be at the beach one evening, and by the poolside the next night. What you should definitely try though, is their Organic Lunch menu. 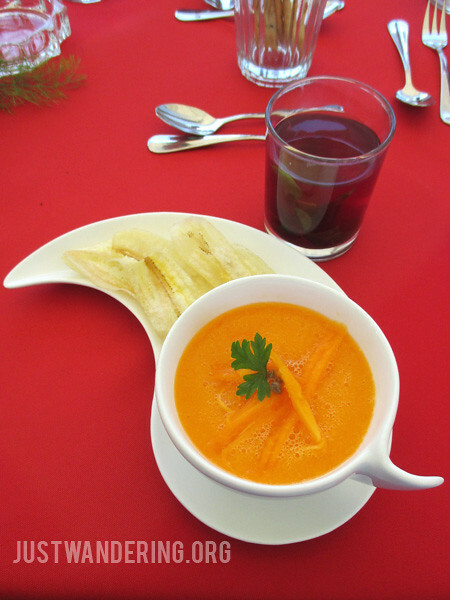 Cold papaya soup. I do not like ripe papaya, but this is so good! This is a tasting menu, featuring vegetables harvested right in the resort’s organic garden. It’s a delightful treat to your taste buds, and is also quite filling. It’s mainly vegetarian, even down to the drinks and dessert — Squash leche flan, which tasted absolutely delicious. We stayed in Badian for three days and two nights — quite short by the standards of other guests who stay a minimum of 7 days and staying sometime for almost a month. As I float around in our private pool on our third day, I will the time to slow down, so I can have more time in the island. Suddenly, staying longer made sense. If you spent most of the year slaving away, and you only get a couple of week’s time for a break, why not go all out and spend your hard earned holiday relaxing by the beach, sipping cocktails out of a coconut? It’s not a bad way to live. As the crew serenade us as we board the speed boat back to the mainland, I found myself smiling, and overjoyed — when I read about this practice of theirs, I thought it was kinda corny (and thought the same as we arrived), but after spending time at the resort, and being tended to by these wonderful people, I felt so thankful for their warm hospitality. It’s no wonder foreign and balikbayan visitors enjoy this place so much — it’s very Filipino. 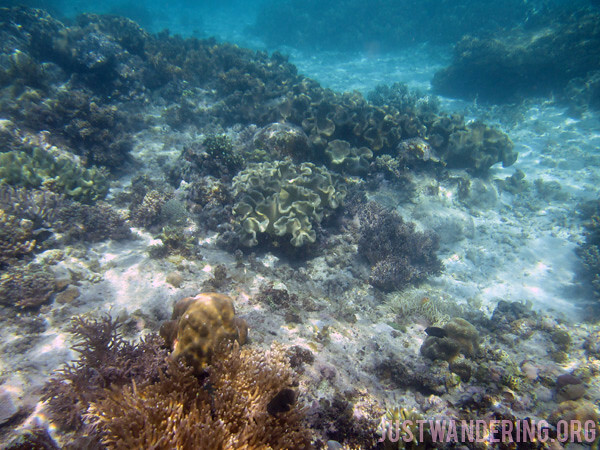 More photos of the resort and the coral garden over at the Just Wandering Facebook Page. Much love goes out to Renz and her lovely crew at the Badian Island Resort and Spa for the warm hospitality and letting us beg off from the early morning yoga and afternoon Zumba session. It would have seriously ruined the peace in paradise. Thanks also to Char of Agoda, who helped made this happen. Have to agree. Not a lot of people are getting paid to travel. You’re lucky. Hi there! As I said, I do not get paid to travel. 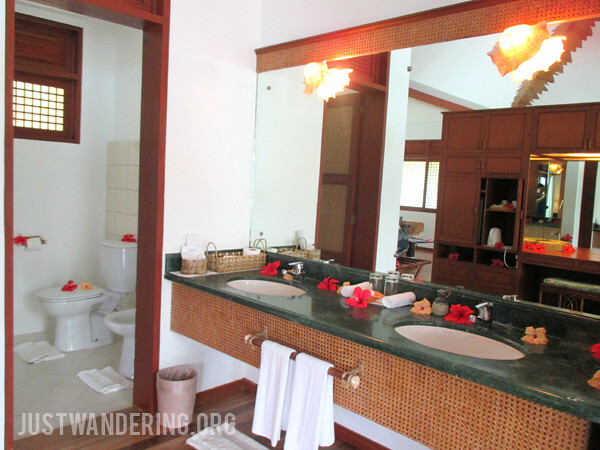 The resort sponsored my stay, but I shouldered all my expenses outside of the resort stay. A lot of my trips are actually not sponsored: I pay for them. As mentioned above, traveling and travel blogging is not my job — it’s my hobby. I’m visiting Cebu this weekend and I would love to visit Badian. Too bad kulang sa time. Lovely staycation place! Super lovely! Kapag andun ka na, ayaw mo nang umalis! 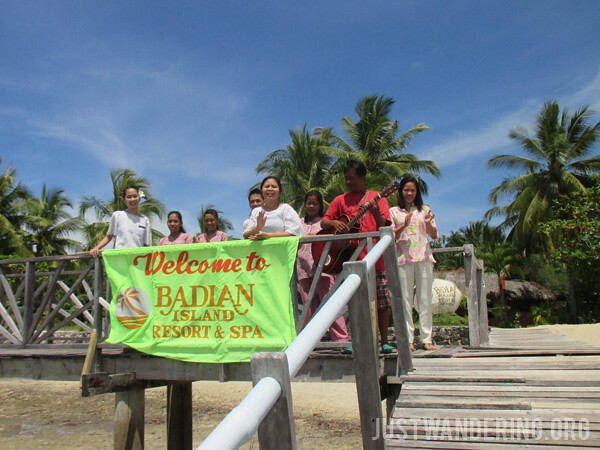 Thanks for introducing us to Badian! Will be travelling to Cebu this summer. Hmm mukhang maganda to puntahan. Never been here but soon this place will be known. I just went to their website and this place so damn expensive.